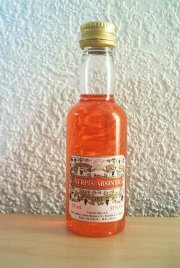 An anise free version of the red Serpis absinthe aimed at the German market which prefers the slightly more bitter taste. I would think that it might do well in cocktails, but other than that I'd stick to the regular Serpis. This particular variation of the Serpis Absinth is made without anise and is not as sweet as the other two (classic 55% and 65%), hence the name Serpis Dry. In the aspect of an absinthe, this is not even close - due to the fact that, as I said, there is no anise. Upon tasting it neat is presented a very heavy taste of alcohol and a little candy like flavour. Adding water to it obviously produces no louche at all and the taste is only watered down. There is really no need to further describe this drink other than that it has nothing to do with true absinthe, and more resembles a high alcohol Campari bitter than anything else. I do think that it would make a very good mixer for drinks, but that's it. The Serpis Classic is way better. If you want absinthe, stay away. If you want a mixer or a candy-bitter, go for it.